snowdeal.org > ex machina: hallo, red-breasted nuthatches! well, winter can't be too far away when the winter birds arrive and it appears that red-breasted nuthatches have arrived in town marking the waning days of warm weather ( although they do migrate south earlier than many species ). i suspect we'll see many more in the coming weeks. 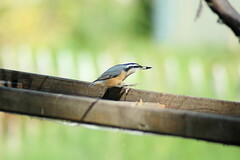 our bird guide notes that the birds visit feeders, quickly grab a single seed and fly off to crack it open. yup, that's about right. the behavior makes them hard to photograph as they don't hang around for long. after a somewhat slow summer odin's birdfeeder is bustling with activity with purple and yellow finches, house sparrows, blue jays and now nuthatches visiting throughout the day.